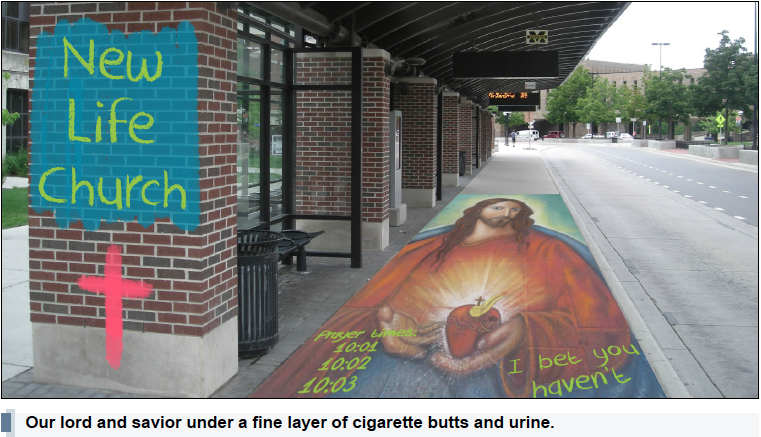 Citing a desire to connect with a hip, young demographic, Ann Arbor’s Holy Life Church launched a new marketing campaign that will include “a continued and increased use of sidewalk chalk,” wrote the church in a press release. Additionally, work has begun on giant murals, which will feature images of Jesus Christ engaging in such tasks as mentoring innercity schoolchildren, jumping the Grand Canyon on a motorcycle and playing lead guitar in the rock band Van Halen. The marketing campaign will seek to portray the church as a fresh alternative to traditional organized Christianity, which tends to drive young people away due to a decreased relevance in modern life, strict, unworkable social stances and a distinct lack of sidewalk chalk. Other elements include more flexible worship hours, contemporary religious music and casual services, but “those are all secondary to the chalk,” said Rev. Thompson. Holy Life initially had trouble amassing enough sidewalk chalk for the endeavor, but has since acquired a four-year exclusivity contract with Crayola’s chalk division, said Rev. Thompson. While most student reaction to the campaign have ranged from “meh” to “whatever,” some groups have requested that the university cap sidewalk chalk usage at somewhere around 6 pounds per week.